Today’s video is “Pretty Woman” with music by Shankar-Ehsaan-Loy, by playback singer Shankar Mahadevan, picturized on King Khan from the movie Kal Ho Naa Ho. I’ll get to that later but let me give you a little background first. This is a pivotal Bollywood movie for me because it’s partly responsible for my current addiction to the genre. I had seen Devdas along with Nandini and other dosto at the Walker Art Center in Minneapolis back in September 2003; the seed was planted. In the following years I saw Monsoon Wedding, Bend It Like Beckham, and Kandukondain Kandukondain. These Indian related movies swirled in my head a few years. Skip forward to August of 2006 and I’m looking at a Netflix page thinking, “Hey, I’d like to see that guy from Devdas in something.” I figure “that guy” is Shah Rukh Khan and put Kal Ho Naa Ho in the queue because it’s recommended. So I watch this movie and am stunned by how LONG it is! I’m disappointed that it’s set in what is supposed to be New York. Hey! This isn’t right, I wanted a real Indian movie set in India. Then I see this “Pretty Woman” scene and get that feeling you get when you’re embarrassed by someone, even worse that being embarrassed for yourself. But THEN the movie takes this turn that I never expect. Shah Rukh Khan is so dramatic that I’m sucked in. It has a love triangle, self sacrifice, and an emotionally wrenching hospital scene. So half way through, I accept it as a good movie and all I know is I want more! Then I saw Kuch Kuch Hota Hai, followed by Main Hoon Na. Then I watch Main Hoon Na again with Nandini and I sense another Bollywood junkie. It’s like SRK was a gateway drug to Bollywood. Next discovery is the pure cocaine of Amitabh, and the angry young man movies. HOOKED! I pick up a Hindi street naam of Sita-ji after watching Dance Dance, to keep it real. So the addiction begins! I stay with Bollywood, because it’s what I know, it’s safe. I believe that if I slip into Tollywood and Kollywood, and I’ve had a taste of the Telugu and Tamil scene people, it would be like taking crack, possibly meth. I have to stay away from Rajinikanth for now. And Lollywood would be like heroin, unmanageable. I need to stay as clean as I can, so it’s mostly Bollywood for now. I saw Nandini the other night, and we whispered a bit about Nollywood, careful to not let too many people hear, but knew to back off, it was just too dangerous. And we know that kal ho naa ho, but it’s still good to play it safe. And speaking of New York and India, our friend Brahmanandam, a.k.a. Tim, sent a great link to Indian restaurants in New York City; “A Passage to India,” by Matthew Fishbane. Click here to check it out the article published in the January 13, 2008 in the New York Times. Thanks to nacromanser for providing the video. Wow Beth! Thanks for the link. Another thing that caught my eye from “Pretty Woman” in KHNH was the American flag being unfurled. Glad to know this song affected you enough to start a thread at http://www.jaman.com/. I just joined to read more. on January 17, 2008 at 7:16 am | Reply Richard S.
Sitaji, I was very intrigued by the description of your Bollywood addiction; I can relate a lot to it (although mine has so far come mostly from YouTube clips; the song-and- dance numbers are incredibly addictive all on their own). Among the other film industries that might be dangerously addictive, I’m wondering if you should add Mollywood. I’m saying this now because I have suddenly become a big fan of Padmini – though I know she performed a lot in Hindi and the other languages, in addition to her native Malayalam. the Malayalam singing/Idol show. I have spent lots of time watching that and got really into the contestant Vani. Of couse then wrote a post about it. And also hipped me to Megha. And I first saw your blog when looking around for information on mujras after coming across so many from such a wide spectrum on youtube, then I did a search and found your post “About Those Mujras” which was interesting and helped explain the genre to me. I know what you mean about the youtube clips being addictive enough, but seeing the songs within the actual context of the movie is great. Finally, as far as the restaurant post, I just added it at a friend’s suggestion and I know nothing of NYC. Just trying to put a little food back into Bollywood Food Club. I’m sure you’ve got more accurate information and should definately add it to your blog. Sounds like you’re in a great neighborhood for food and Bollywood and Mollywood movie rental. Be careful Richard! Hey Sita-ji! Kal Ho Naa Ho is one of my favorite films, ever</em, hands down. What’s funny is I had such a similar reaction to it…When I saw “Pretty Woman”, I had a “Maybe this whole Bollywood thing isn’t going to work out for me” moment(it was very early in my Bolly-watching days) and almost turned it off. I’m SO glad I didn’t! By the intermission, SRK had me hooked, just like you were! There were so many brilliant shades to this film…the unique approach to a “love triangle”, the comedic scenes with SRK/Saif, the Rani/Kajol cameos, the diary scene, Preity and Saif learning salsa, the scene where Naina tries to tell Aman how she feels and leaves in tears, as we slowly learn the real story…I could go on and on…. I’ve shown this movie to 3 people on 3 separate occasions and they have ALL loved it! Once you know the story, the shock value goes away, but its still so much fun to watch because of the way the characters work so well together onscreen! And its pretty neat to watch it with someone who’s never seen it before because they’re usually so moved and caught off guard by the twist…. This one’s right up there on my favorites list… It could arguably be #1. Thanks for your comment Nida. 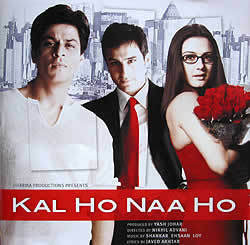 I’ll remember to use Kal Ho Naa Ho as an introductory movie (drug) since it worked so well with your friends and with us too. 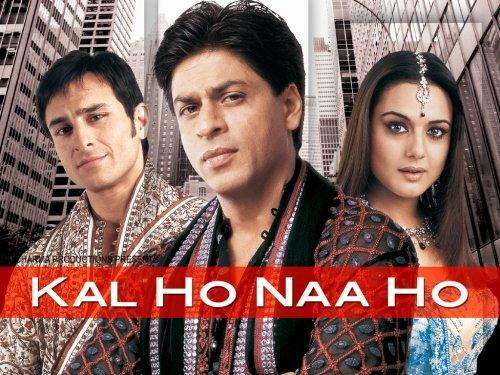 It’s funny, Kal Ho Naa Ho is not one of my favorites, mostly because it breaks one of my cardinal rules: Shahrukh Khan should never ever die, ever (sadly, I cannot appreciate Dil Se for the same reason). SRK does act well while bleeding through the mouth though, like in Devdas, where he also dies. on March 15, 2008 at 4:49 pm | Reply Richard S.
Hi. I wanted to get back to this post because, purely by accident (months after you wrote this), I happened to find the entire film in installments with subtitles on YouTube…and now I know exactly what you mean. I loved it too – which surprised me, because I also didn’t expect to at first. But I thought it was great. I can see now exactly how the addiction took hold. on March 21, 2008 at 11:54 pm | Reply Richard S.
Hi, Sitaji. Thanks for the links – I hadn’t seen these before, and it was very interesting reading them. (Though I don’t understand why you think they are “much better” than yours.) And now, I have two more blogs to explore. Also, now I have lots of material for a blog post on the subject (maybe). Wow, very nice post and discussion. I like these “how Bollywood found me” stories. I just read Memsaab, Filmigeek and you and will move on to Bittenbybollyood’s respective story after this. @Memsaab, i personally don’t reject SRK dieing, but i prefer the demise very much Dil Se style over the dragging, embarrassing KHNH style. Overall, any non-lethal scripts are much more to my liking though, and in this regard Dil Se is offputting. Other aspects i like in that dance are the multi-cultural crowd and the outdoor setting. Bollywood has way too many dances in dark disco grottoes (including in KHNH) (one of South Indian movies’ advantages is more outdoor footage, including dances). One thing i miss about KHNH and maybe other Farah Khan dance directions are dances that take the plot further, maybe are even interrupted for a bit of dialogue and then picked up again. If i see it right, as long as Farah Khan dances are shown, at least in KHNH, the plot is on Pause. – There’s a lot of fast talk here, and it is very difficult to follow the subtitles (more difficult than on other movies i feel). We do have an acceptable German synchronisation, still if you have once heard the original voices, the synchronisation just doesn’t feel right. Thanks for the long and thoughtful comment here. I love reading stories of how people, particularly non Indians, got hooked on Bollywood. BittenbyBollywood’s story is a nice one.